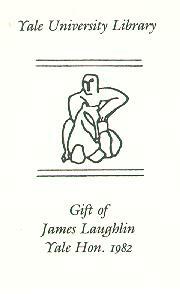 The New Directions Collection was given to the Beinecke Library by James Laughlin and consists of the set of New Directions publications which Laughlin gave to his mother and all additional publications received from the New Directions Publishing Corporation. It is part of YCAL even though it contains publications by non-American authors. It is an almost complete run of the firm's publications. Warning: Only New Directions publications with the bookplate containing the image of a man on a horse class with New Directions (see image at right). New Directions publications without this bookplate class elsewhere. The following guidelines are used when marking volumes for New Directions. New Directions is classed as a name collection and uses a sequential number for monographs and serials. Serials and monographic series or multipart items which are open entries are assigned year/number call numbers preceded by S on the same line as an indication that shelf space is to be left for additions. "New Directions book" is considered a phrase and put in a quoted note if New Directions does not appear in the publication, etc., area. "New Directions paperbook" is considered a series, but is not traced (see LC Authority Record). "New Directions paperbook original" is not considered a series but is given as a quoted note (see LC Authority Record). Although this statement may sometimes include numbering (e.g., "A New Directions paperbook original, NDP978"), this numbering cannot be used to extrapolate a "New Directions paperbook" series statement. "New Directions classic[s]" is considered a series and is traced as "New Directions classics" (see LC Authority Record). If a SML copy is already in Voyager, and the item in hand has a series statement that is not present in the Voyager record, the cataloger should check the item on the shelf (or call for it from LSF) to determine whether the two copies match and should be placed on the same bibliographic record; if the items do not match, the utilities should be searched for copy, and if no copy is found, the existing Voyager record can be used to derive a new record. If an item in hand has a series statement and copy for the title exists in LCDB or OCLC, but the copy does not contain the series statement, the cataloger should assume that the copy does not represent the item in hand and use the copy to derive a new bibliographic record.